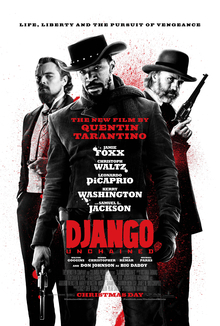 Set in the antebellum era of the Deep South and Old West, a freed slave Django (played by Jamie Foxx) who treks across the United States with a bounty hunter Doctor King Schultz (played by Christoph Waltz) on a mission to rescue his wife Broomhilda (played by Kerry Washington) from a cruel and charismatic plantation owner Calvin J. Candie (played by Leonardo DiCaprio). The best performance by a mile is Christoph Waltz – he is the heart of the movie. Waltz’s Doctor King Schultz single-handedly balances the entire film, evening out the tone between moments of intense horror and humor and mediating the film’s internal battle between historical fact and its post-modern aesthetic. He is the Yang to the film’s Yin, filling out the missing part of the scenes and even providing a human perspective into what’s happening when the audience does not what to feel in certain situations. Whenever Christoph Waltz is not in the movie, it is heavily felt. Leonardo DiCaprio’s Calvin J. Candie is a great villain and brings a scary presence. Scary is something we haven’t ever seen Dicaprio accomplish so it was quite fresh to see. He sings Tarantino’s dialogue, projecting a charming demeanor on the surface while carrying a constant petty evil underneath. It’s not Oscar worthy (if anything, he should have won for The Aviator) but a powerful performance nonetheless. Jamie Foxx’s lead performance as Django seemed off to me. Particularly his voice threw me off because his inflections sound too modern. Everybody else seems to have an accent from the era, but he does not use a southern accent, or any accent. He just sounds like a black man from 2012. Django’s progression of intelligence was unconvincing to me as well. There were times where he seemed dim-witted and other times where he seemed sharp, and it felt unnatural. It is not a screenwriting issue, but in how the performance was delivered. It was as if Foxx focused on playing the “Man with No Name” western genre hero and did not know how to balance it with the historical context of black slaves in America. He just did not carry enough pain in his eyes. However one may feel about Tarantino’s frequent use of the N word, he definitely has a strange obsession with it. As horrible as this sounds, I was surprised how other racial slurs from that era were not spoken in the film. (I am not going to name them here. I will defer you to watch that scene in Clerks 2.) There is a quality in Tarantino’s crass, in-your-face direction that suggests that he gets off rebelling against social taboos. That telling him that something is politically incorrect will push him to do it in order to disprove you. That’s my speculation anyways. The film is way too long. Simply put, it’s ill-disciplined in the sense that Tarantino wants his cake and eat it too. He wants to tell his story and communicate a statement but also wants to amuse himself by inserting things that he enjoys and cannot reign himself in. There is a gag where a major comedy star shows up in a cameo which I found problematic. In fact, it was problematic in the exact same way I found Mike Meyer’s cameo was in Inglourious Basterds. In a film where it’s trying to balance historical fact and a post-modern aesthetic by mediating film genres, seeing a modern comedic actor show up for a cheap laugh is just one extra layer too many and it took me out. Did the gag make me laugh? No. Did it progress the story? No. Then why is the gag there? Tarantino wants it to be, that’s why. A reason that I prefer Django Unchained over Inglourious Basterds is that Tarantino doesn’t try to make every scene into a dialogue set piece. The opening set piece in Inglourious Basterds is the best thing Tarantino has written (he says so too), but every proceeding scene seemed like he was trying to recreate that for the rest of the movie and it got tiring. There is a point in the Django Unchained‘s final act where the story could have concluded but it proceeds for another half hour. I could have cut 20 minutes out of the film and it is that exact 20 minutes that holds the film from being something masterful. Yes, that includes Tarantino’s cameo. Tarantino shouldn’t act in his own films. Maybe he shouldn’t act at all in anything but he was the worst part of his own film. All that said, I enjoyed it much more than Inglourious Basterds ( I am so relieved it didn’t end with a character uttering “Hm, maybe THIS is my masterpiece.”) Tarantino fans may love the extra fat, but I would have preferred a leaner steak with more discipline. It’s just that little difference, if only Tarantino reigned himself in.